As fun as Facebook can be, not everybody is going to like it. Some people get too wrapped up in finding new friends and replying to stuff posted by old friends that they get worn out. Other people simply won’t find the network appealing from the get-go, perhaps because they feel it intrudes too deeply into their personal life. If you’re considering deleting your Facebook profile because you’re concerned about potential online privacy issues, you could look into changing your Facebook settings instead of deleting your profile completely. 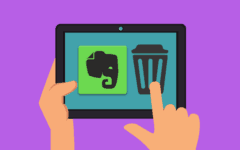 However, if you’re set on leaving the platform, there are a couple different options available to you – you can opt to temporarily deactivate or permanently delete Facebook accounts. 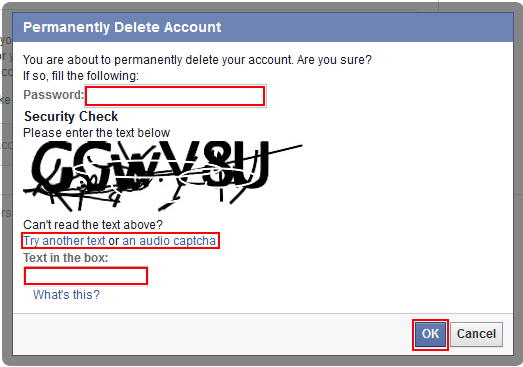 To start, let’s go over the steps for how to deactivate your Facebook profile temporarily. 1. Go to www.facebook.com in your web browser and log in. 2. 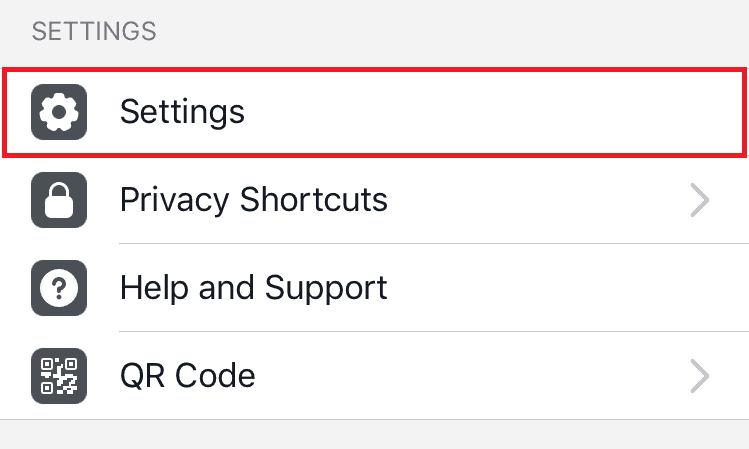 Click the arrow beside the privacy shortcuts icon ( ) and select Settings. 3. Click Security, and then click Deactivate Your Account. 4. Before you deactivate your account, you will be given the opportunity to send messages to some of your friends on Facebook to say goodbye, if you want (see our Facebook Messages tutorial if you need a refresher on how to do this). Otherwise, click a button beside one of the options labelled “Reason for Leaving” to indicate why you’re deciding to deactivate your profile. 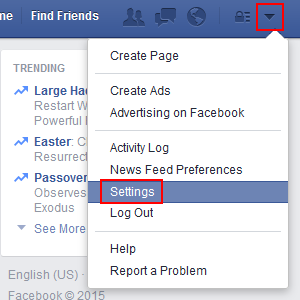 Facebook will give you a quick tip on how to remedy your issue, based on which option you choose. You can also click inside the box labelled “Please Explain Further” if you feel like giving additional details on why you’re cancelling your profile, but you don’t have to. There are two further options. If you click the check box beside “Email Opt Out,” you will not receive any notifications via email from anyone on Facebook for as long as your profile is closed. You can also click the check box beside “Auto Reactivate,” and then click the drop-down menu in the yellow box and select a time frame. This lets you automatically reactivate after a certain time, if you’re just taking a break from the network and know how long you want to leave for. When you’re all set, click Deactivate. 5. You will have to re-input your password to confirm that you really want to deactivate your account. Click in the box labelled “Password”, type in your account password, and then click Deactivate Now. Next, we have a little more information for you about what happens when you deactivate your account. Keep these things in mind if you’re going to deactivate your profile temporarily. 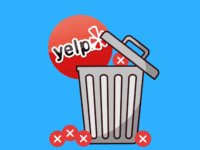 When your profile is deactivated, nobody will be able to see any information associated with your profile or Timeline, and nobody will be able to find you on the site or app. However, certain information, such as messages you have sent to other people, may still be visible. Deactivating your account will not remove any of the content you’ve posted on Facebook, so it will still be there when you reactivate it. You will receive a confirmation email when you deactivate your profile. If you open it and click Reactivate Account, you will be prompted to log in. If you do so, you will be able to use your profile again. 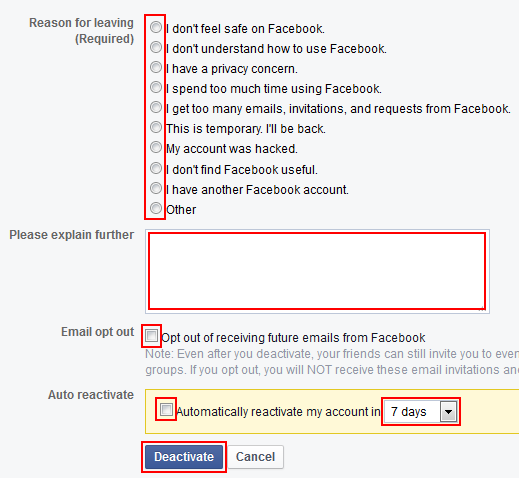 You’ll have this option for 14 days after deactivating your profile. Also, if you have deactivated your account at least once before, you will have to wait at least 24 hours to reactivate it. 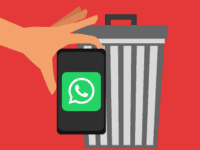 Still wondering to yourself “how do I delete my Facebook account permanently?” If you’re looking to get rid of your profile for good rather than just for a while, move on to the next section to learn how to permanently delete a Facebook account. 2. 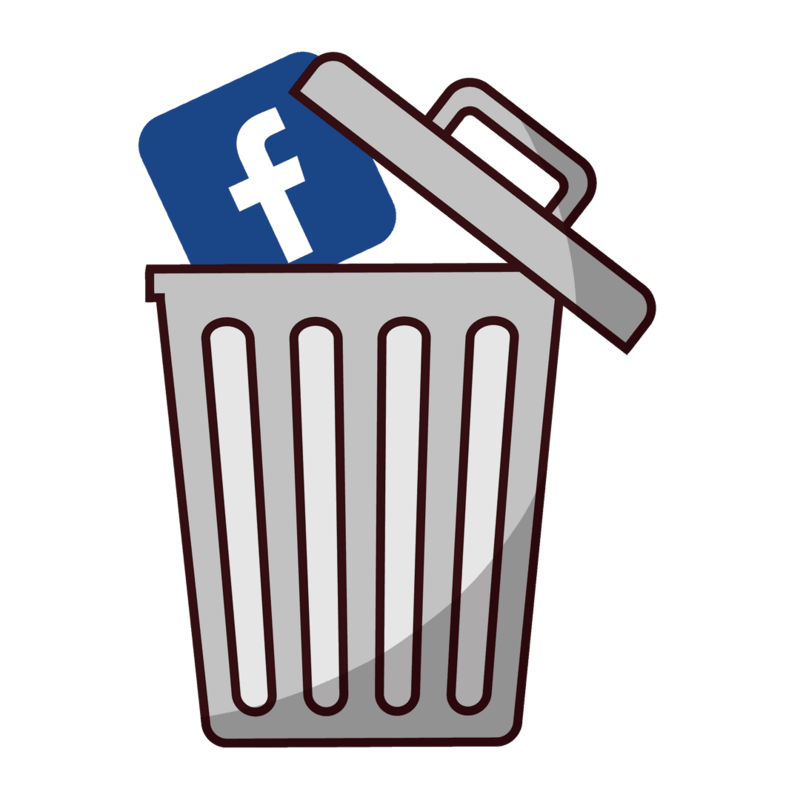 Go to this link for permanently deleting your Facebook account. 3. Click Delete My Account. 4. 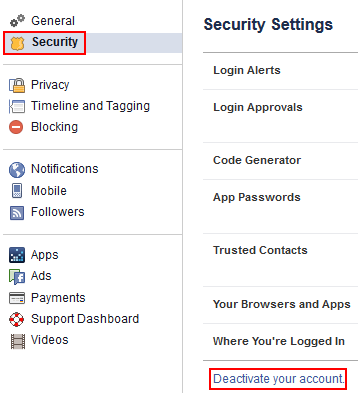 In order to confirm that you really want to permanently delete your Facebook account, you must enter two pieces of information. The first is your account password, so click in the box labelled “Password” and type in your password. 5. You must also complete a security “captcha”. This is a standard security test that many websites use to block people from using computer programs to automatically do certain things repeatedly, such as create or delete accounts. Click in the box labelled “Text in the Box” and type in the letters and numbers that you see in the distorted graphic. If you’re having trouble seeing them, you can click Try another Text to create a new graphic, click An Audio Captcha to hear what you need to type in, or just ask somebody you trust for help. When everything’s filled in, click OK.
That’s all you need to do to delete your Facebook account on your computer. 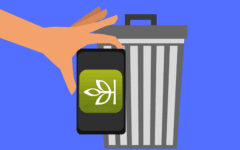 If you’d like to cancel your Facebook profile from your Android or iOS mobile device, we’ll show you how to do that next. 1. 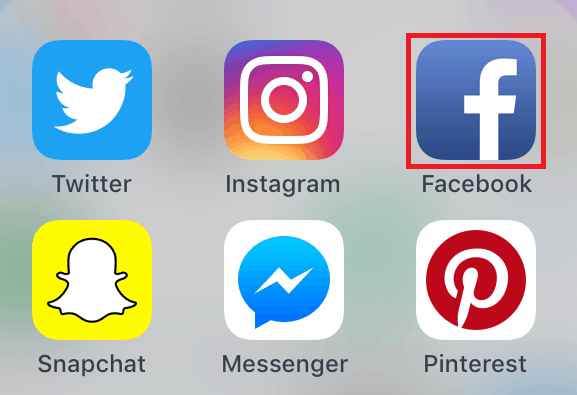 From your device’s home screen, launch the Facebook app. 2. Access the Facebook menu. 3. Scroll down and select Settings. 4. Get to your general settings. 7. Select the reason you want to deactivate your profile, then scroll to the bottom and tap Deactivate. 8. 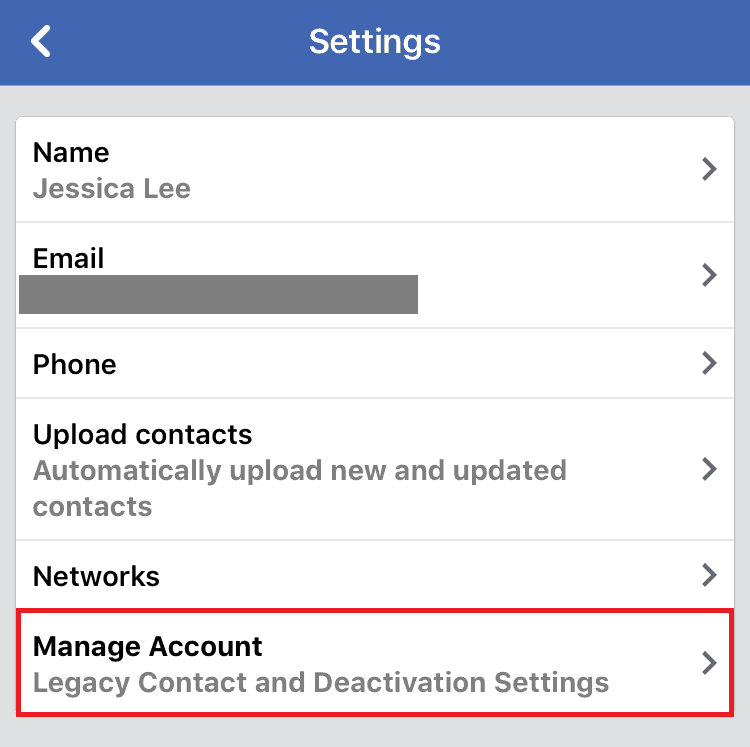 You’ll see confirmation on your screen that your account has been deactivated, and the Facebook app will return to the log in screen. 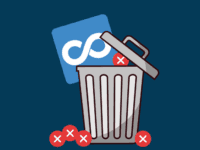 If you’re choosing to permanently delete your account from Facebook, check out our notes on deleting your profile below. 1. 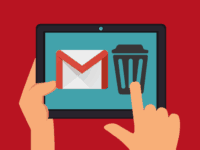 Like when you deactivate your account, if you choose to delete your profile, you will receive a confirmation email. If you open it and click Reactivate Account, you will be prompted to log in. If you do so, you will be able to use your Facebook account again. 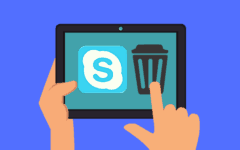 However, this option is only available for a few days after choosing to delete your profile, so if you change your mind, be sure to act quickly! 2. 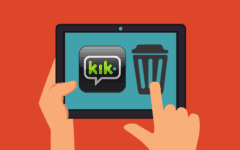 When you choose to delete your profile, it may take up to 90 days to delete all content associated with your account. During this time, that content cannot be seen or accessed by anyone else on Facebook. 3. Even if you delete your account, certain information, such as messages you have sent to other people on Facebook, may still be visible. 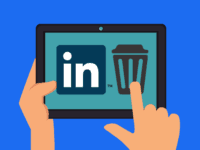 They may also keep certain data about your profile for technical reasons, but will remove anything from it that could identify it as being from your specific profile. 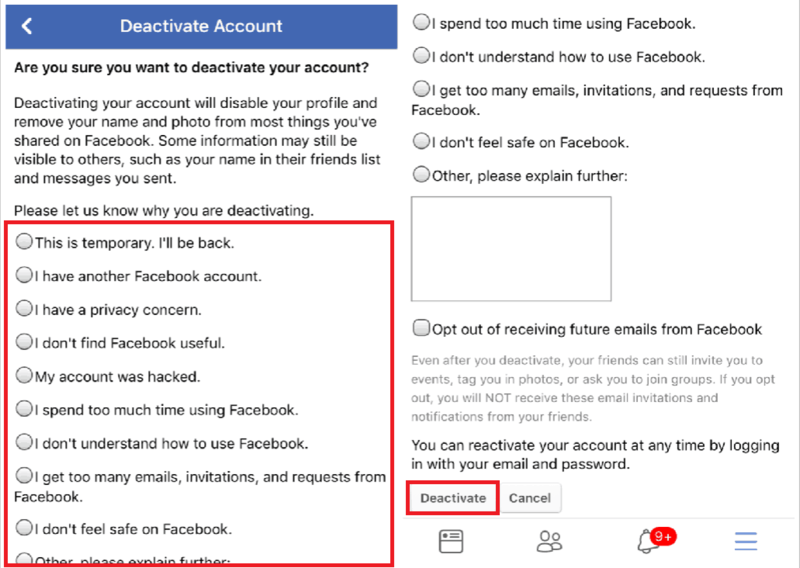 That’s all you need to know about deactivating or deleting your Facebook account on your computer or on your mobile device. Now, whether you want to leave Facebook for another day or part ways with it permanently, you’ll know how to do it! 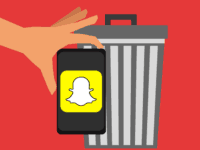 If you’re interested in trying out a different social media platform now that you’re no longer using the network, check out our list of recommended alternatives and our social media category for more information.